Housed in a colonial-style mansion, Victory Dawn offers elegant rooms with classic wood furnishings. 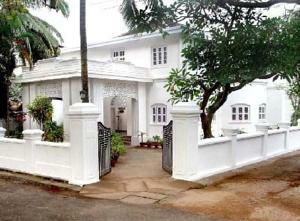 Just 330 ft from Fort Cochin Beach, it has comfortable lounge areas and a business center. Fitted with hardwood floors, charming rooms have air conditioning and a small sitting area. In-room comforts include a safe, tea/coffee making amenities and a private bathroom. Located in the historic district of Fort Cochin, Victory Dawn is a short walk from Cochin Parade Ground and 25 miles from Cochin International Airport. Car rental service and free parking are available. For convenience, a tour desk offers help with travel arrangements. Laundry and ticketing services are also provided. Free! One child under 5 years stays free of charge when using existing beds. One older child or adult is charged INR 2399 per night and person in an extra bed. Maximum capacity of extra beds in a room is 1. There is baby beds in a room is 0 capacity for cots in the room. Supplements will not be calculated automatically in the total costs and have to be paid separately in the hotel.